The gallbladder is a small organ, three to four inches long, located directly beneath the liver. It acts as a bile reservoir; it concentrates bile. During digestion, the gall bladder contracts and secretes its bile in order for the small intestine to digest fats. Bile is secreted from the gall bladder through what is called the cystic duct into the common bile duct, and, finally, into the small intestine. Some risk factors contribute to the formation of gall stones. A tendency toward gallstones may be inherited. When other people in your immediate blood line have had or exhibit having gall stones, this increases the likelihood of your devolving gall stones as well. As you get older, more cholesterol accumulates in your system, increasing your chances of developing gall stones. Being overweight increases your chances of developing gall stones, due to the increase of fat deposits and possible increase in the level of cholesterol in your body. Quick weight loss can change the chemical components in the body and thus cholesterol crystals have a higher likelihood to form. In these last two cases, a drug that has been proven helpful in losing weight and not developing gall stones is called Ursidioxiacid. Pregnancy changes in the body's chemistry, and the increase of weight or other contributing factors also contribute as described above. This factor, of course, decreases with the onset of menopause. Alfalfa See under Herbs, below. Essential fatty acids As directed on label. Important constituents of every living cell. Needed for repair and prevention of gallstones. Lecithin granules or capsules 1 tbsp 3 times daily, before meals. 1,200 mg 3 times daily, before meals. A fat emulsifier; aids digestion of fats. L-Glycine 500 mg daily, on an empty stomach. Take with water or juice. Do not take with milk. Take with 50 mg vitamin B6 and 100 mg vitamin C for better absorption. Essential for the biosynthesis of nucleic and bile acids. Multi-enzyme complex with ox bile As directed on label. Take before meals. Aids in digestion if too little bile is secreted from the gallbladder. Caution: Do not give this supplement to a child. If you have a history of ulcers, do not use a formula containing HCI. Vitamin B complex plus extra vitamin B12 and choline and inositol 50 mg 3 times daily, with meals. 2,000 mcg daily 500 mg daily. 500 mg daily. All B vitamins are necessary for proper digestion. Use a high-potency formula. Important in cholesterol metabolism and liver and gallbladder function. Vitamin C 3,000 mg daily. Deficiency can lead to gallstones. Vitamin E 600 IU daily. Prevents fats from becoming rancid. Alfalfa cleanses the liver and supplies necessary vitamins and minerals. Twice a day for two days, take 1,000 milligrams in tablet or capsule form with a glass of warm water. Peppermint oil capsules are used in Europe to cleanse the gallbladder. Other beneficial herbs include barberry root bark, cat­nip, cramp bark, dandelion, fennel, ginger root, horsetail, parsley, and wild yam. Caution: Do not use barberry during pregnancy. For inflammation of the gall bladder, eat no solid food for a few days. Consume only distilled or spring water. Then drink juices such as pear, beet, and apple for three days. Then add solid foods: shredded raw beets with 2 tablespoons of olive oil, fresh lemon juice, and freshly made uncooked applesauce made in a blender or food processor. For gallstones, take 3 tablespoons of olive oil with the juice of a lemon before bed and upon awakening. Stones are often passed and eliminated in the stool with this technique--look for them. You can use grapefruit juice instead. To relieve pain, try using hot castor oil packs on the gall bladder area. Place castor oil in a pan and heat, but do not boil it. Dip a piece of cheesecloth or other white cotton material into the oil until the cloth is saturated. Apply the cloth to the affected area and cover it with a piece of plastic that is larger in size than the cotton cloth. Place a heating pad over the plastic and use it to keep the pack warm. Keep the pack in place for one-half to two hours, as needed. Eat a diet consisting of 75% raw foods. Include in the diet applesauce, eggs, yogurt, cottage cheese, broiled fish, fresh apples, and beets. Avoid sugar and products containing sugar. Avoid all animal fat and meat, fried foods, spicy foods, margarine, soft drinks, commercial oils, coffee, chocolate, and refined carbohydrates. A detoxification program for the liver and colon is important for improved gallbladder function. Use cleansing enemas if you have chronic problems. Do not overeat. Obesity and gall bladder disease are related. Females aged forty and over who are overweight and who have had children are more likely than most people to suffer from disorders of the gallbladder. Rapid weight changes can cause gallbladder problems. The recommended treatment for gallstones is usually surgical removal of the gall bladder. If symptoms are not too severe, this is usually first approached through what is called laparosopic surgery, a one day procedure where four small incisions are placed in the abdomen. A carbon-dioxide inflation is placed into the area to allow it to expand and a small tube with a camera at the end is inserted which sends a transmission back to a television monitor so that doctors can view the area. A clamp is placed on the cystic duct and the gall bladder is removed. After the procedure, you may go home the same day and return to normal activity within a week or two. Sometimes, if there is a need to remove the gall bladder immediately, a cholecystectomy is required. In this case, a large incision is placed in the area of the liver and gall bladder and the organ is clamped cut and removed. This may require a five-day hospital stay, and allow returning to normal activity after three to six weeks of home recovery. Sometimes, while performing laparoscopic surgery, doctors will assess what needs to be done and switch to performing a cholecystectomy. Both these procedures take about an hour and general anesthesia is administered prior to any surgery. Tell your doctor if you know you have any sensitively to any form of anesthesia. Sometimes after the operations you may experience some gas and/or flatulence along with diarrhea while the body is seeking to normalize itself. However, if gallstones show up on an x-ray but do not cause symptoms, there is no need for surgery. 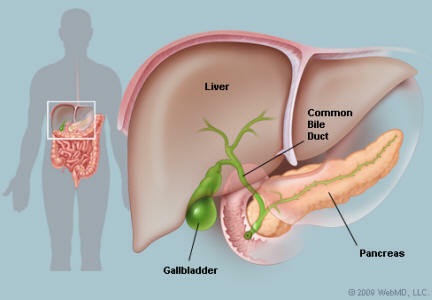 A gallstone may slip into a common bile duct. If this occurs, extraction or surgical removal may be necessary. If the stone is large enough, it can be removed. This works in single occurrences and with medications to prevent others from forming. Sometimes stones in the gallbladder can be fragmented or dissolved without surgery, using drugs. Sound waves were thought to be useful but they are no longer considered helpful as surgeons cannot pinpoint the stones as accurately as needed in too many cases. Bile acid preparations used to dissolve stones work very slowly and can be used only on small stones.